Happy Wanderer I really like your playing, it is so full of joy. BTW, what kind of box is that? I think the chordal accompaniment on the second long note doesn't sound right to me. Thank you for pointing out this mistake. At which second in the video does this specific chord play? My box is a Weltmeister Cajun, in the key of C, with dry tuning. Today, I uploaded more polka videos. I also included the Marine's Hymn. Why? Because it is March, the perfect month for Marching Music! Dear God, thank you for helping me get, and play the Melodeon, and Harmonica. I also thank you for helping me learn to read sheet music. Amen. I especially liked the Marmalade Polka. Today, I recorded two more polkas! Dear God, thank you for helping me get, and play the Melodeon, and Harmonica. Amen. Happy I didn't think the Beer Barrel would really fit on a one row but I have to congratulate you! You used every available fold on that one row and have inspired me to give it a try. Today, I recorded four songs! Three waltzes, and one polka! Dear God, thank you for helping me get, and play the melodeon, and harmonica. I am extremely grateful for these gifts. Amen. I've just watched the 4. My favorites are the 1st and 4th. In the last (4th), very nice this repeated touch some 6 times the same note. Congratulations. The work is very nice. 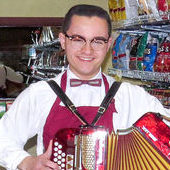 The Helena Polka seems to be usually done on the PA and the Chemnitzer Concertina. I couldn't find any other button box versions of it on YouTube. Nice man. Yeah, another smart also. Play songs that are rare to find another versions in videos, or are rare of inexistent with melodeon playing. Today, I recorded some more songs! Your really making that one row sing Happy! That's FANTASTIC Happy W, really good to listen to!!! Thanks! I think I did the Jenny Lind right this time (I could be wrong!) Last time I made many mistakes. Either way, I am glad you enjoyed the tunes! Dear God, thank you for helping me get, and play the melodeon and harmonica. I am extremely grateful for these gifts! Amen. I have recorded some more tunes! I have also been recording my tunes on the harmonica, but I won't put the links here, as this is a melodeon forum. Excellent Happy! Keep em coming. That harmonica thing sounds rather difficult. I wonder how she did it? Search for "tongue blocking". You put your lips around three holes. With your tongue you block the two on the left and play only the melody through the right hole. Rhythmically you put your tongue back, so that air flows through all three, than put your tongue back. Today, I have recorded some more tunes! Enjoy!